We have one large and very flexible meeting space which is available for meetings/conferences or workshop and networking events. It is easily accessible for disabled attendees,with two disabled parking spaces just at the rear of the building. There are also plenty of local car parks a short walk from Great Bow Wharf. So what makes us special? Well, we think you'll love the building. Not only is it attractive and comfortable but it was renovated sustainably. Some of the environmentally friendly features are the zonal underfloor heating from a wood pellet boiler, sun tunnels, and rainwater harvesting. Evidence of its history has been preserved wherever possible - from the safe in the Stuckey room to the recycled beams and floors - and you can see features of the wharf's working life. Ask us and we'll show you around. We are very proud that feedback shows that most of our clients come to us because of personal recommendation. What better testimony can there be? 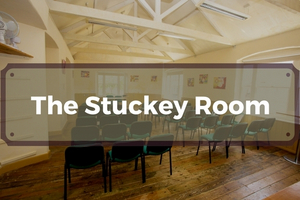 Unlike many other venues we simply charge you for what you need - there is a hourly room hire rate so you are only charged for time you occupy the room.